the c word has always believed: companies are at their best when they have a competitive-edge, creative-thinkers, community collaborations and a focus on making a positive impact on society. That’s how we’ve always run our business, and that’s how our clients also operate. Shared value, a term officially coined in the Harvard Business Review in 2011, has given business, government and non-profits a name to use. 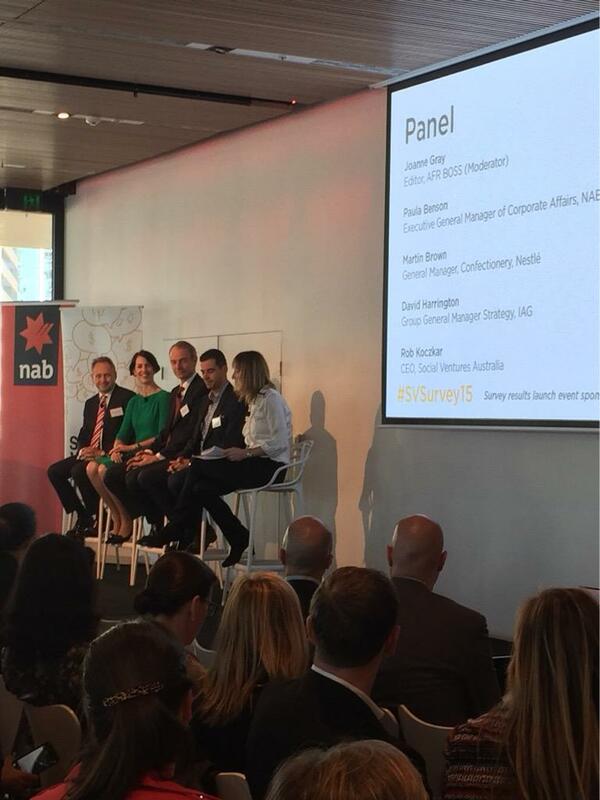 Today our client The Shared Value Project released the results from the 2015 ‘State of Shared Value Survey’ with a panel discussion hosted by NAB along with media partner AFR Boss Magazine. You may have also seen details of the survey in your Friday morning copy of AFR’s Boss Magazine. We’ve just left the panel discussion and we can report that while the global movement might be strong, Australian businesses are making shared value their own. It can be seen in companies across the nation from insurers to banks to FMCGs. You may already recognise the concept within your own organisation. If so, you should join the community of Australian business leaders committed to advancing shared value in Australia. The results of the survey, which are now available online or in the latest issue of AFR’s Boss Magazine, present an impressive picture of shared value in Australia. The survey targeted a combination of ASX100 companies and other organisations with demonstrable experience or interest in creating shared value. The report also includes some great examples of shared value in Australia, and provides evidence of the challenges facing companies wishing to pursue a shared value strategy. Whatever business you’re in, we encourage you to pick up a copy of the survey results and find out more about shared value. Thanks so much for this Jack and hopefully the report will stimulate more conversation in the corporate and NFP community.